Roy Sebastian, Chief Hockeo, Sachem for Life of the Eastern Pequot Tribal Nation is married to Virginia Sebastian, Rose Basket, a Cherokee descendant. They have three children and six grandchildren. 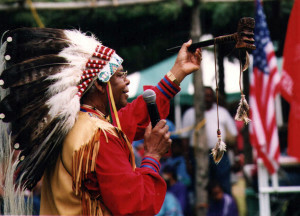 Chief Hockeo served as Chairman of the former Eastern Pequot Indians of Connecticut Tribe from 1976 to 1997. He worked with state and federal government authorities regarding Native American rights and affairs. He spearheaded the initial filing of the federal acknowledgement petition with the US Department of the Interior in 1978 with the assistance of his brother William Sebastian Neese Mattox, Vice Chairman, his family, Council, tribal members, academic professionals and friends. He worked with his family to procure the first comprehensive grant from the United States Department of Health and Human Services to assist Native American Tribes with status clarification and capacity building. He is the founder of the Eastern Pequot’s charitable Wuttooantam Foundation (He who cares). He has always led tribal spiritual ceremonies and participated in community celebrations honoring Native Americans including the march in Washington DC for the grand opening of the Native American Museum. He was honored by the Mashantucket Pequot Tribe with a Chief’s eagle feather headdress and a medallion for maintaining Native American culture and traditions. From 1942 to 1988 he worked in numerous positions such as: a welder, carpenter, chef, and senior sales associate. In his spare time Roy volunteered to preside and work with parent teacher associations, youth organizations, and became lay leader and trustee for the United Methodist Church.